The York Train Show Rolls Into Town: Check Out These Model Trains in Ewing, NJ! The next York Train Meet is coming up in April, from the 19th through the 21st. If you’re an enthusiast of train sets in Ewing, NJ, this is an event you won’t want to miss! The York Train Meet originally began in 1969 and has been steadily growing ever since. Back in the old days, all attendees would have to cram inside a single room, fighting to get to the perfect location. Today, the event has spread out across a whole lot more space, and attendees are able to get much more enjoyment out of the event. The Meet now uses all of the buildings at the York Expo Center and Fairgrounds, including three dealer halls, four member halls and one or two operating layout halls. The event hosts 13,000 to 14,000 people of all ages, including members and guests alike, at each meet in April and October. The York Train Meet is truly one of a kind. As it began growing in popularity during the ‘70s and ‘80s, it started to draw members from the Train Collectors Association and beyond, all of whom came looking for a rare or unusual item to add to their collection. The event now happens to be the biggest recruiting ground for the Train Collectors Association, the largest international organization for model train collectors. Members are allowed to bring as many guests as they wish. However, guests are only allowed to attend one meet, and must join the Train Collectors Association if they wish to continue attending the event in the future. Information about registering for the meet is available at www.yorktrainshow.com. If you are interested in registering for the Train Collectors Association, you’ll also find that information at the website, but there will be plenty of people on hand at the event itself to help you. Come and check it out and see for yourself if it’s something you’re interested in! The Meet begins on a Thursday at noon, and runs through Saturday evening, beginning at 9 a.m. on both Friday and Saturday. After this April meet, the next meet dates will be October 18-20, 2018. Meets are always at the York Expo Center and Fairgrounds. It is highly recommended you look for lodging in the area ahead of time, as the event draws a large number of out-of-town visitors. Simply put, this is a must-see event for model train enthusiasts of all ages. Bring your friends and family members, especially your children! It is a great event to bring new generations into the hobby and keep the tradition going for decades to come. For more information about the upcoming event, we encourage you to contact us today at Trains & Things—we’re looking forward to the event ourselves, and would be happy to tell you more about our own model trains in Ewing, NJ! February 13, 2019 Alisha N.
"Everyone is very helpful and informative here and Nick (the dog) is certainly a highlight. 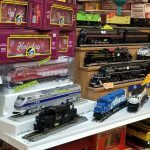 I was able to get the right train and bridge nece..."
February 8, 2019 Matthew V.
"Fantastic train store and Tom is great to work with." January 9, 2019 Alex C.
"I love this store! Everyone there is friendly and helpful, they have good deals on lots of stuff. There's also a really cute Siberian Husky ..."
December 16, 2018 Steve A. "One of my 2 favorite train shops. Always welcoming and friendly to everyone from "newbies" to "experts" ." "5 star because I didnt want to drag the score down. It all things O gauge ONLY! NO HO scale!"